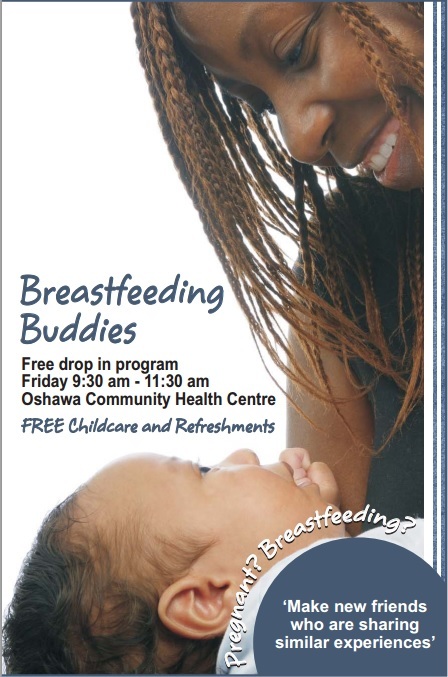 Breastfeeding Buddies is a support group for all mothers in Oshawa interested in breastfeeding. The great thing about these type of groups is that they’re not always for moms seeking support, per se. These type of groups are also a great way to meet other moms living in your area who are likely to have something in common with you! All conversation is guided by a trained group facilitator to make sure that the group is a judgement-free zone for any of the questions you ask or experiences you share. Breastfeeding support groups are all about encouraging group members to share their nursing experiences so that everyone can learn from each other. The Breastfeeding Buddies group offers peer support for mothers, children and other family members. The group is held every Friday morning, from 9:30-11:30am in Program Room 1B at the Oshawa Community Health Centre (115 Grassmere Avenue, Oshawa). Refreshments are provided and a Public Health Nurse is also available to help with any concerns. Cost: There is no cost to attend this drop-in group.